Industrial and Manufacturing Industries can depend on barcode technology to manage industrial warehousing details. Barcode stickers and tag produce by warehousing barcode software is useful for manufacturers, importers, exporters, wholesalers, transport for proper management of goods and merchandise. Barcode labeler software supports major Linear and 2D barcode fonts for creation of barcode images suitable for Manufacturing industry and Warehousing industry barcode labeling needs. Barcode generator software to create Linear and 2d barcode labels. 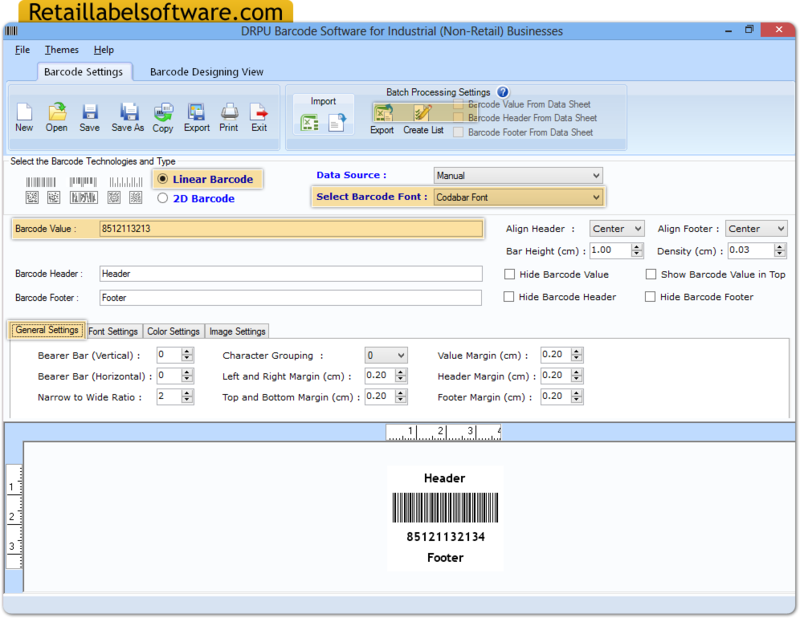 Barcode software supports to create customized barcode label. Generate Barcode Labels in required format with option to specify Barcode Value, Barcode Header and Barcode Footer details. Provide option to save Barcode images in different file formats including JPEG, TIFF, BMP, PNG, WMF, EMF, EXIF and GIF. Provide option to create Barcode Labels with option to print images with barcode printers. Supports major software barcode readers and scanners.